This just in– I have been briefly corresponding with a researcher-scholar and novelist who is seeking sound information regarding the Elkin-Gass friendship, both personal and professional, to wit, their relationship. Both of these literary lions were/are profs at Washington University in St. Louis and major figures in 2oth-21st century literature. He kindly compressed his main points and area of interest in the subject in the following brief post. I you are able to assist him, please do. 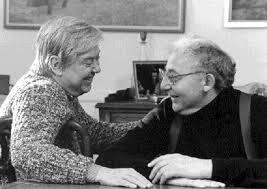 I am wondering if anyone can enlighten me with regards to the working relationship/friendship between two brilliant writers, William H. Gass and the late Stanley Elkin, who were professors at Washington University when I was enrolled there in the 1970s. I had the privilege of taking an undergraduate course taught by each of these gentleman and always suspected that their relationship was respectful — that they each admired the other’s work — but assumed that their diverse personalities (an understatement) precluded them from forming any real bond. Did they mingle at faculty functions? Exchange gifts on the holidays? Bolt for different corners of the campus upon seeing each other? If there is any information out there, published or otherwise, that might shed some light on what the nature of the relationship between these writers/professors was, I would be appreciative if someone could point me in that direction. I would be especially interested to hear from current/former faculty members who may have worked with both men and observed their interaction, or lack of it. This entry was posted in Literature, writing and tagged American Fiction, Author Query, literary canon, Stanley Elkin, Washington University, William Gass. Bookmark the permalink. When I was in my 20s, he was my mentor at a 3 day writers’ workshop. I almost swallowed my tongue when I found out he was to be my mentor. No idea how or why I was assigned to William Gass. William Gaddis was there (a multiple National Book Award winner), Rust Hills, the fiction editor of Esquire. Others. I was catatonic. Was sure there had been some terrible mistake, that I’d be “found out.” I’d written almost nothing at that point but a handful of poems. He spent so much time with me I was embarrassed. He said I was the new “Dame Edith Sitwell.” I was insulted. He meant it as a compliment. I was such an ignoramus at the time. (still am!) But he is the consummate muse and inspiration. I think about him often. Everything he writes is a surprise and is a snow-capped mountain one has to arduously climb. Risky business. He understands this better than anyone I’ve ever read or brushed shoulders with; and by example he showed me all great art is a risky business. What a phenomenal experience and memory. Oh, I can just imagine the feelings you describe so well here. And how cool to have spent time with William Gass. He has always been generous (to a fault), I think, with “aspirants” to the literary kind of thing and to his students. Very humbling to those whose receive any of his attention–at least this one 😉 Thanks for stopping by!